The fund would be dedicated to undergraduate financial aid and recruitment, and would be enough, a university official said, to cover the difference between the cost of attending and the amount that students and families can pay. Michael Bloomberg, the billionaire businessman and former mayor of New York City, is donating $1.8 billion to his alma mater, Johns Hopkins University, to create a fund that would help low-income and moderate-income students attend without having to worry about the cost, his charitable organization, Bloomberg Philanthropies, announced Sunday. The money would expand the university’s endowment by almost 30 percent, to about $6.1 billion. The fund would be dedicated to undergraduate financial aid and recruitment, and would be enough, a university official said, to cover the full difference between the cost of attending Johns Hopkins and the amount that students and their families can afford to pay. The rising cost of higher education and the heavy debt loads that many students shoulder have become significant political issues in recent years. Liberal politicians like Sen. Bernie Sanders of Vermont have proposed free college tuition for all students, and states like Georgia and New York have set up programs to significantly widen access to their state college systems for low-income students. Bloomberg’s gift comes at a time when he is considering running for president in 2020. It may help to improve his standing with lower-income families, particularly those who are black or Hispanic. But Kevin Sheekey, a top adviser to Bloomberg, said Sunday that the gift was not made with the election in mind. Bloomberg has already given more than $1.5 billion to Johns Hopkins for various purposes, including scholarships, but scientific research and endowed professorships have dominated his giving in the past; the new gift, aimed solely at student aid, represents a shift in focus. Richard Kahlenberg, a senior fellow at the Century Foundation and an advocate of social and economic diversity in college admissions, said that while stronger financial aid was one way to boost the admission of lower-income students, universities also had to make other allowances for them. The announcement of Bloomberg’s gift came with a sentimental backdrop. He recalled in his essay that he was able to afford to attend Johns Hopkins only with a National Defense student loan and a job on campus. His father, a bookkeeper, never made more than $6,000 a year, he wrote. The education he received changed his life, he said, and he was so grateful that he began donating money to the university in 1965, the year after he graduated. His first donation was $5. He called on others to do what he had done — giving money to their colleges and universities — and on the government to do more. “Together, the federal and state governments should make a new commitment to improving access to college and reducing the often prohibitive burdens it places on so many students and families,” Bloomberg wrote. The money will become available to students in the current admissions cycle, and will also be used to replace loans with grants for some students in the spring of 2019. 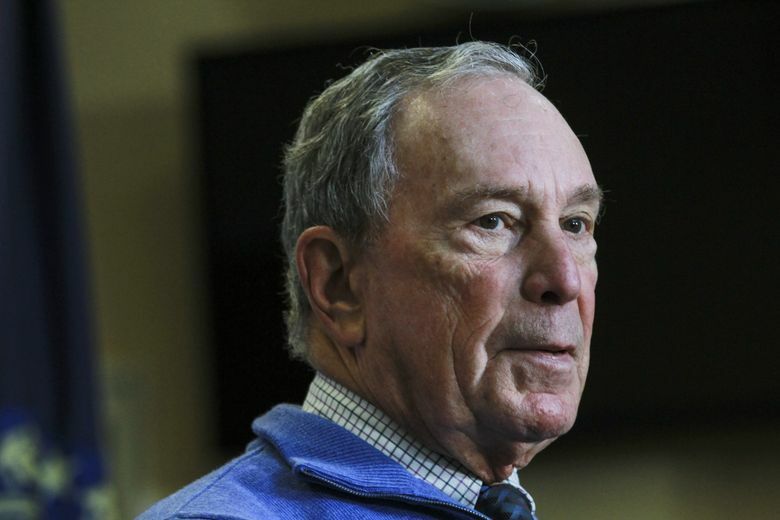 Bloomberg is not asking that his name be attached to scholarships, his aides said. The former mayor is turning over the money as one lump sum, rather than in annual installments, the aides said. Daniels said that the gift brought Bloomberg’s combined donations to Johns Hopkins to more than $3.35 billion. “This constitutes the largest philanthropic investment ever made to any institution of higher education in the United States,” he said. Many elite colleges are now “need-blind” in their admissions, ignoring ability to pay when selecting students and promising that those it accepts will be offered sufficient financial aid to attend. Johns Hopkins has been effectively need-blind for the past seven years, but had not been able to make the policy permanent, officials said. The announcement from Bloomberg Philanthropies said that until now, the university had one of the smallest endowment funds available for financial aid among its closest academic peers. The cost of attending Johns Hopkins for the current academic year, including tuition, room and board and books, is $72,566, according to the university. The average grant to students needing financial aid is about $41,000; that is expected to increase significantly, university officials said. The average family contribution is about $23,000 a year, and that figure would be expected to fall, but university officials said they could not yet estimate how much. Loans, work-study jobs and outside grants are currently used to cover the remaining costs for students. Going forward, students who qualify for need-based aid will no longer have to take on loans as part of their financial packages, though work-study will remain a component. Nearly half of Johns Hopkins undergraduates now receive financial aid, and the proportion is expected to grow with the Bloomberg gift. The percentage of students eligible for federal Pell grants, a measure of poverty, is expected to rise to 20 percent in 2023 from 15 percent now, because more students from poor families would be able to attend, officials said. Unlike some “need-blind” schools, Johns Hopkins said it would not set a specific income threshold for determining whether students are eligible for financial aid. Instead, officials said that eligibility would depend on an analysis of the family’s full financial circumstances, including income, assets, the number of other children in college and the like.